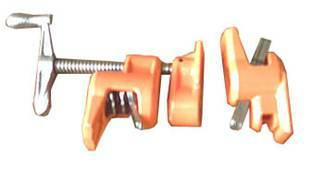 This newly patented pipe clamp is far different from traditional one which has been made of malleable iron. This new one is made of alum. die casting with chrome-like finish and each clamp jaw with nyon pad. 5 pieces of stamped metals are fastened together in each housing so pipe can go through hole without any obstacles Besides all superiors above, the key function is to apply .tail stop with multi clutch for each adjustment . Conversely, the housing can be switched opposite to serve as spreader. 1. 2-3/8” oversize clamping faces for extra security. 2. Tail stop with multi-disc clutch for easy adjustment while holding work securely. 3. Two sides sliding with built in stand legs. 4. 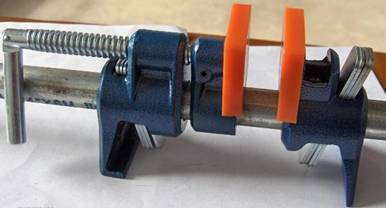 Three times the clamping force of a standard 3/4” pipe clamp. 5. Constructed of heavy duty aluminum alloy with baked enamel finish to resist corrosion. 7. Fits all 3/4” pipe. 8. USA and Taiwan Patent. Black-finished discs, spindle and handle.